A crown is a dental restoration that literally covers a damaged tooth (sometimes also referred to as a cap). Crowns are most commonly used to repair a damaged or broken tooth, or when cavities are too large for a standard dental filling. They can also replace missing teeth with a dental bridge, or cover extensive cosmetic damage. The dentists at Upwards Dental in Asheville and Flat Rock, NC, offer cosmetic and restorative dentistry services. Crowns are one of the most reliable and versatile dental restorations available. With good oral hygiene and regular dental care, the average crown can last for many years. A good dental crown will look and feel just like a natural tooth and make it possible for you to eat your favorite foods and smile with pride and confidence. As a hybrid restorative and cosmetic fix for a damaged tooth, each crown is custom designed for fit, function, and aesthetics so that your smile looks and feels better than before. The entire process typically takes two visits. At the first visit, the dentist will take an impression of your teeth, which is like a blueprint that is sent out to the dental lab where the crown will be constructed. 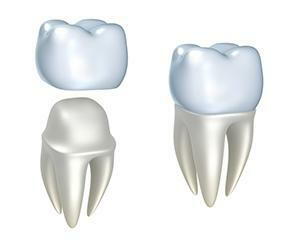 Your tooth will be reshaped if necessary to fit into the new crown. Temporary crowns are usually available while you wait for the permanent crown to be ready. The permanent crown is then cemented in place to ensure a secure and comfortable fit. You can have a new and improved smile in as little as two visits to the dentist. For more information about crowns and other cosmetic and restorative dentistry options, contact Upwards Dental to schedule an appointment with one of our dentists.